Hot this week: A notorious dealer sorta goes down in Germany, but not really. Preserved ancient human sacrifice victims as crime scenes to investigate? Yes please. I’m not THAT lonely! About the informal online networks who work in this field. The manuscripts are in Bamako and the author asserts that they are under threat there too. The piece was repatriated to India but the woman who bought it on eBay maintains it was a fake. “Did they think we did not exist?” A descendant of the design’s creator took KTZ to task. Carter faces 15 charges including fraud, theft, and forgery following a 6 month investigation into financial irregularities and missing artworks at the gallery. The bilateral agreement is meant to combat antiquities trafficking between the two countries. The 71 pieces were stolen from the National Museum of Fine Arts in Havana last year. Apparently the Cuban has requested asylum in Greece, a country not known for tolerating art thieves. Over 110 pieces have been recovered by Mexico recently. The bill would allow private companies to provide services to archaeological sites. Congress repealed it, the president vetoed the repeal, and now congress has overridden the veto. The cartoons, which aren’t really very provocative, have become a freedom of speech issue. The faculty have not removed the artworks. Thieves stole artist Hula’s paint and other supplies. 50 years ago the Norton Museum was robbed, Asian jade pieces taken. These are the remains of 31 individuals returned by the University of Michigan. The Portland Museum of Art is exhibiting the stolen Wyeth paintings that have recently been located and returned. Still no paintings recovered from the famous Gardner museum heist. Where have all the Mayflower monuments gone? Items stolen from this small Tennessee museum were also recovered. The thieves stole Lincoln but left Ike untouched. Calling in the Feds for this presidential theft. The day after Thanksgiving 30 years ago a de Kooning was stolen from the UA Museum of Art. More on the theft of de Kooning’s “Woman-Ocre”. Some are calling poaching of fossil bone in Utah a “gold rush”. Studying chemistry of looted fossils to determine their source. The forgery art of J.S.G. Boggs who spends his bill work in normal transactions. Edgy. An eBay seller was willing to take a loss; usually when lost/stolen sacred items come up for sale they are too expensive to be bought back. A long piece on the possibility that it is a fake. The French government is looking into Gerard Lhéritier’s “Aristophil” as the fund’s own purchased may be accelerating the market. For selling a fake Olmec head to a German citizen. No jail time. What’s going on with the Gurlitt hoard? A large number of very important works taken. Sigh. ISIS? Someone actually said that. It’s gone weird. The 5 frescoes stolen and trafficked from Paestum were recovered from the Italian-Swiss border region. Spain’s National Heritage office tried to transfer 4 works from the Prado including The Garden of Earthly Delights by Bosch. This didn’t go over well. The Virgin of Nuestra Señora del Pozo was stolen from the church of Juramento in Córdoba. More on the theft at the church of Juramento in Córdoba. A look into the police operation that netted these fakes. After the theft of the Códice Calixtino, the Cathedral realised they had to up their security measures. The Greta Moll portrait case. The National Gallery is citing “good faith purchase”. Do you know these men? Authorities want to talk to them about the NMS coin theft. Images of both the coins and possible suspects in the theft have been released. The Rosslyn Chapel panel of the Great Tapestry of Scotland has not been recovered. The jewelry robber used the historic gravestone to batter down the door of a shop in St Ives. The plaques date from the 1920s. A video on faking of Chinese antiquities. Valuables and medals were stolen from the ancestral home of the poet. Kuvempu’s Padma Bhushan and Padma Vibhushan medals were stolen. Following the theft at the Kuvempu memorial, a discussion of security in place at heritage sites. The poet’s medal has not been recovered; the thieves say it got lost. They were paid in advance for the theft. Kolkata is not only a transit point, Indian antiquities are flowing out of the city. The idols were taken from the Chandrasekhar Jew temple located at Kapilash in Odisha’s Dhenkanal district. The stone idols are from 3 to 4 feet tall and were taken from the entrance area of the temple. The Durga was stolen from a temple in Bansdeeh area, Ballia. Focus on the thefts in Bihar and Ballia. Bihar Chief Minister Nitish Kumar is pushing for a probe into the theft of the Lord Mahavira. The Koh-i-Noor “as a particularly irksome reminder of the injustice of colonialism”. Discussions at an event at the Lahore Museum focused on site destruction. The country is hoping to gather tips about the whereabouts of about 200 missing pieces owned by Imelda Marcos. Fake Vicente Manansala artworks are coming up regularly. What does this mean for the Filipino art scene? Part of this is a long-term loan of artefacts to the very museum that just returned Kapoor loot. They were not declared as “cultural goods” when they were imported which is a violation of Swiss law. Important: this was a licensed antiquities dealer with a lot of illegal coins. 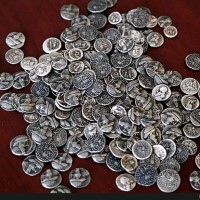 The Ottoman coins were discovered in Gaza and police were called when a disagreement broke out because of them. Real research, based on satellite info. The objects were reportedly stolen from the Palmyra Museum. 200 kg of tusk! Impounded on the Russia/China border hidden under the false floor of a truck. A sealed 125-year-old beer bottle is still legally a heritage object. You can see why a polystyrene cow dangling from a helium balloon might have bothered some people in Rajasthan but that isn’t an arrestable offence. Note, it was a pro-cow installation. An association of Christian layers has issued a criminal complaint against artist Abel Azcona for using consecrated hosts in his artwork. A tragic loss for us all. A massive feud which include the theft of skulls from traveller’s graves. The skulls have not been recovered. David Charles has pleaded guilty to the brain theft from an Indiana medical museum.